Parathyroid Surgery Introduced and Explained. Parathyroid Surgery Basics: Old-Fashioned Exploratory Parathyroid Surgery Vs Mini Surgery. Parathyroid surgery is introduced here. The standard 'big' parathyroid operation is out of date and requires the surgeon to "explore" your neck to find your parathyroid tumor. Nobody should have this large old-fashioned parathyroid operation. Virtually all patients should have a mini-operation, even if their x-ray scans are negative. How is parathyroid disease treated? Surgery is the only way to treat parathyroid disease (hyperparathyroidism). There are no medications or pills that work to cure or treat parathyroid problems or high calcium. The parathyroid tumor must be removed by a surgeon. Up to 35% of people will have more than one parathyroid tumor, so the surgeon should examine all four glands. As soon as the parathyroid tumosr have been removed, the patient is cured! It is very likely this will change your life. If you have hyperparathyroidism you need to have parathyroid surgery. If you have an expert surgeon this operation should be very easy. We have a mini-parathyroid operation for you to watch. Everybody should have a mini-operation. Click Here to watch a movie of this operation as it occurred live (no editing-takes 13 minutes for entire operation). Since 1925, the standard treatment for parathyroid disease (primary hyperparathyroidism) has been to surgically remove the parathyroid gland (or glands) which are overproducing parathyroid hormone. Remember, this is a hormone problem, so the goal is to remove the source of the excess parathyroid hormone (remove the bad parathyroid gland, leave the normal parathyroid glands). Again, the concept is really quite simple: Find which parathyroid gland has become a tumor and is making too much parathyroid hormone and take it out...leaving the other normal parathyroids alone. The normal parathyroid glands will take over and you will be cured. You don't need all four parathyroid glands. The standard operation requires a large incision often as big as 6 inches. The 'standard parathyroid operation' is the old way of performing parathyroid surgery. A large incision is made in the neck, the muscles of the neck are retracted sideways and the thyroid gland is loosened up and moved aside to allow the surgeon to identify the four parathyroid glands which reside moderately deep in the neck behind the thyroid. Patients having a 'standard parathyroid operation' are always hospitalized over night, and sometimes as long as a two or even three days. The incision for the standard parathyroid operation has to be made of sufficient length to allow the surgeon adequate exposure of the numerous important structures within both sides of the neck, and thus it is typically six or seven inches long. These wounds eventually heal nicely but you will have a big scar on your neck forever. 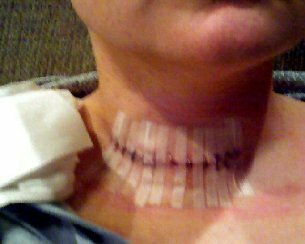 The picture on the left shows the incision needed to expose the parathyroid glands on both sides of the neck when doing the old-fashioned parathyroid surgery. This is the operation that your doctor may be reluctant to send you for--often for good reason. The key words to knowing you are going to have this operation is the surgeon will say he/she will "explore" for the parathyroid glands. This operation is a very out-dated. There is better technology available. You can do better. Keep reading--and remember--exploring should be done on vacations in the mountains, not inside your neck! 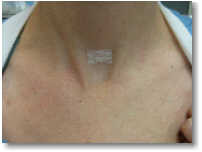 Because of the numerous small nerves and other important structures within the neck which reside around the parathyroid glands, the 'standard' parathyroid operation can be technically challenging and has the best results when performed by experienced endocrine (parathyroid) surgeons or surgeons with extensive head and neck operative experience. Numerous publications in medical journals have shown that the success rate following parathyroid surgery is directly related to the number of parathyroid operations the surgeon has performed (we have a page devoted to cure rates). This is what you will find when you read about parathyroid surgery in every text book, or on any web site on the Internet: the experience of the surgeon is more important than anything else. The cure rate for a standard parathyroid operation performed by a general surgeon is about 85 to 90% when performed through the big incision you see above and at the bottom of this page. Endocrine surgeons have a cure rate between 93 and 97%. On other pages you will see that newer forms of mini parathyroid surgery have cure rates of 99% or better in most patients--depending on the skill and experience of your surgeon. During the standard operation, the surgeon must identify all four parathyroid glands and remove whichever one(s) is enlarged. As covered in the section describing hyperparathyroidism in detail, the majority of time there is just one large parathyroid gland (an adenoma which is a benign parathyroid tumor) and three normal parathyroid glands. In this situation the one large gland (the parathyroid adenoma) would be removed leaving the three normal parathyroid glands to function in a normal fashion indefinitely. If the surgeon found all four parathyroid glands to be enlarged (found in about 5% of patients and called "parathyroid hyperplasia"), he/she would typically take out 3 or 3-1/2 of these glands leaving some parathyroid tissue behind to function normally in the future. In experienced hands (endocrine surgeons who have done over 250 of these operations), this big old-fashioned operation has a cure rate of about 94-95 percent, but can be as low as 85% for surgeons who operate on parathyroid patients infrequently. This big-old-fashioned parathyroid operation typically takes 3 to 6 hours to complete (depending on the case and the skill of the surgeon), and 10 to 15 percent of patients will not be cured after the operation. As many as 5 percent will have a serious complication depending on your surgeon's experience. You can expect to spend 1 to 3 nights in the hospital. If your surgeon discusses having surgery this way, and "exploring" for your parathyroid glands, you may want to find an expert surgeon (endocrine surgeon) who performs parathyroid surgery on a more frequent basis. However, parathyroid disease is an uncommon problem, so almost all surgeons only know how to do parathyroid surgery the old-fashioned way--the way they saw it done years ago when they were learning. Tell your endocrinologist and/or your family doctor that you want a surgeon who is an expert in parathyroid surgery and that you do not want the same general surgeon that they send their gallbladder and breast biopsy surgery patients to. 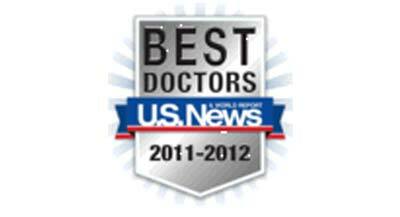 Ask for an endocrine surgeon. The surgeon will "explore" for the parathyroid glands. This will take between 3 and 6 hours (usually about 4 hours). Cure rate is very dependent upon the experience of the surgeon (as high as 92% by experienced endocrine surgeons, and as low as 80% for general surgeons who perform only a few parathyroid operations per year. VERY IMPORTANT. Often the parathyroid glands are very hard to find, so the surgeon can't accomplish the first item on this list. Risks are dependent upon surgeon experience (read more about this on another page). Complication rates extremely dependent upon the experience of the surgeon. Expected blood loss is low (less than 1/4 cup...no need to prepare for possible transfusions) but depends on skill of surgeon. Standard parathyroid operation is expected to take 3.5 to 4 hours, but may take as long as 8 hours or as short as 2.5 hours... depends on the skill of the surgeon. The incision is fairly big, but usually heals nicely. Almost unheard of to get infected or have a wound problem. IMPORTANT: This is no longer the standard way of doing parathyroid surgery--everyone should be checked to see if they can have a minimally invasive parathyroid operation before they elect to have the 'old-fashioned' standard parathyroid surgery. This cannot be over-emphasized! For almost all patients, this operation should no longer be done! We NEVER do this operation and think it should never be done by any surgeon on any patient. Please put this on your Website. I had my parathyroid operation in December 2008 by some other surgeon and not by you... and this is what happened to me. I first went to a surgeon that said the negative parathyroid scan meant that there was no tumor. I am 35 years old, well educated, had major bone pain for about 8 months, (crippling at times) and other typical symptoms. 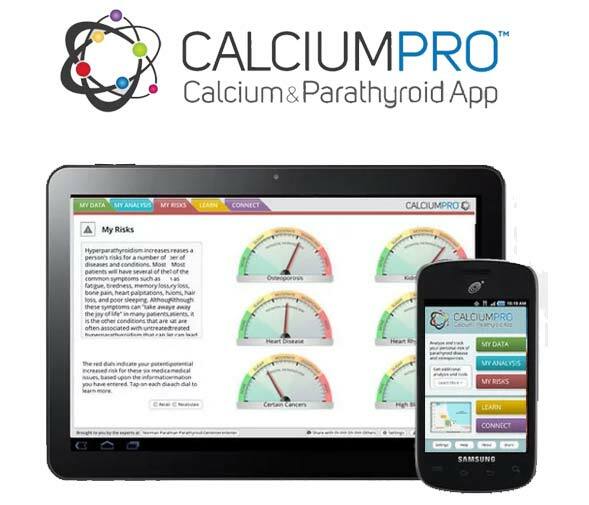 My calcium levels were 13.6 with a PTH of 178. I'm no doctor, but I KNOW this is severe hyperparathyroidism. I realized I knew more about this than the first surgeon so I went to another surgeon. I had another scan done; this time it showed a faint object, so the surgeon decided to go in and "explore" for my parathyroid glands. He was going to "try" a mini operation first, and if he could do it, he would. This photo shows what the outcome was. The operation took almost 4 hours and I spent almost 2 days in the hospital. The incision makes me sick when I see how small and quick your parathyroid operations are. Please put this picture on your website to show others of the " old school" parathyroid procedure. I thought I could get a good operation by my local "best guy". Obviously this is why people go to Tampa. Editors note: This is very typical of parathyroid surgery performed by surgeons who don't do this operation every single day. We actually see this every day, and quite a few that are worse. This was done in Fort Worth, Texas... not exactly small-town America. Parathyroid surgery performed this way is big and dangerous... and not successful at least 5-10% of the time. The picture at the top of the page which shows the neck cut wide open is exactly what this lady's neck looked like during the first part of her parathyroid surgery, and what yours will look like if you don't have an expert. Look, we can't perform everybody's parathyroid operation, so please, do your homework. Do not have parathyroid surgery done by some local surgeon because he was a great guy when he fixed your husband's hernia or took out your gallbladder! You have a high chance of a poor outcome. If your surgeon says he/she will "explore" to find the parathyroid glands, then be prepared for your neck to look like this. This lady almost surely would have had a 1 inch incision and an operation that took 25 minutes if we did her parathyroid surgery. She would have gone home about a 1.5 hours later, and out for dinner with her family. The picture to the right is typical of our operations performed on the same size woman. Our photo was taken 7 days after the operation just like the picture above. Be smart! 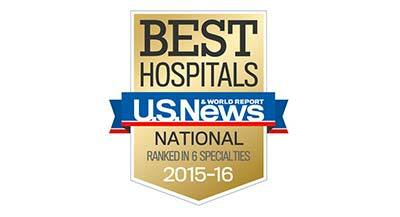 Find an expert parathyroid surgeon. Minimally Invasive Radioguided Parathyroid Surgery. Essentially ALL patients can have an outpatient procedure to cure parathyroid disease and to remove a parathyroid tumor. It all depends on the skill and experience of your surgeon. Keep reading. Look at some parathyroid tumors that have been removed from patients with hyperparathyroidism. GOOD! 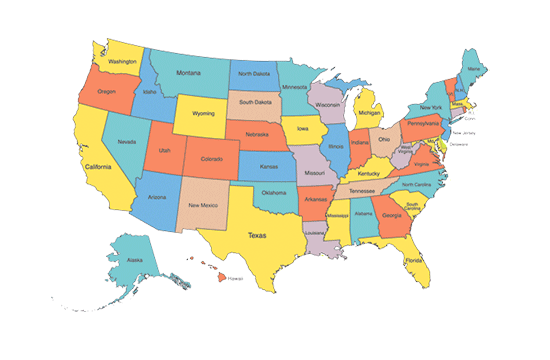 View a Map of where our patients come from. We've probably operated on one of your neighbors. Read what patients say about having mini-surgery at the Norman Parathyroid Center. Chen H, Zeiger M, Gordon T, Udelsman R. Parathyriodectomy in Maryland, Effects of an endocrine center. Surgery 1996;120:948-53. Sosa JA, Powe NR, Levine MA, et al. Thresholds for surgery and surgical outcomes for patients with primary hyperparathyroidism: A national survey of endocrine surgeons. J Clin Endocrinol Metab 1998:83:2658-65. Mittendorf EA, McHenry CR. Complications and sequelae of parathyroidectomy and an analysis of surgeon experience and outcome. Surgical Technology International XII. 2003:152-157. Norman J, Politz D. Failed parathyroid surgery: The high personal and financial cost of surgeon inexperience. 2012.